Book in One Word: PROSEY. 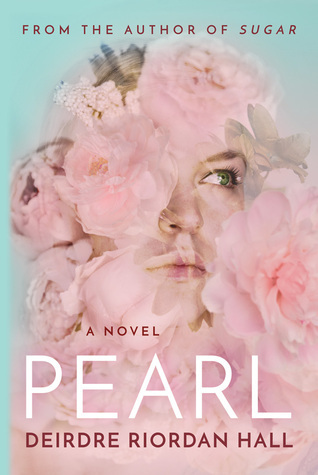 Pearl grabbed my attention with the promise of art, music, and the compelling idea of a character whose mother is a washed up, drugged up, once-upon-a-time rock star. (Honestly, that last point had me sold.) It didn't hurt that I was also intrigued by Hall's previous novel Sugar (which I still need to read). When I picked Pearl up, I was immediately pulled in by the lovely, excellent prose. But there soon arose a slight problem. I though the concept behind Pearl was quite interesting: Pearl is seventeen and doesn't have much a life, and it's all thanks to her mother, the once great Janet Jaeger of The Shrapnels. But the life of a rock star consumed Janet, and she succumbed to the seduction of drugs and alcohol, giving up her life, motherhood, and nearly everything she owned just to get a fix. The result is that Pearl and Janet are virtually homeless and having nothing and no one, aside from each other--and even that's not the best. But then Pearl gets the chance to attend an elite boarding school and change her life for the better; she gets to actually have a life. But things aren't always that easy. Did you ever do that exercise in school where you had to explain how to make a peanut butter and jelly sandwich in a step-by-step process? The thing was that you had to be very specific, explaining all the steps and making sure the person opens the lid and all that jazz or else the person reading the instructions wouldn't be able to successfully make a sandwich. Pearl was missing a few steps. It really started and is most apparent with the romance. Pearl becomes enamored with Grant, and he with her, but it just sort of happens. Don't get me wrong--I liked Grant, I did, and I liked it when they were together. But it's very hard to feel passionate about two being together who are passionate about each other when the slowburn and the steps to that passion weren't there and I, therefore, have trouble feeling it. The page count was on the shorter side and the font type is smaller than average, making the book somewhat longish, and I wish more time was spent building up relationships (both romantic and not) and making them believable--and real. The thing about Pearl is that she can be rather frustrating, which in turn makes me, the reader, frustrated. You'd think that Pearl wouldn't do certain things and would really try to have a better life at boarding school, but she still does some things that are so, well, stupid. And it drives me crazy when characters do what other characters do for no viable, logical reason at all--"If you're going to jump off a cliff then I WILL TOO"--and Pearl did that a lot and it irritated me. You can do so much better, Pearl; quit throwing away your damn shot. And some of her friends--Sorel, Vicki--were not the best of friends, if you ask me. (Bad choices, people. You're making bad, stupid choices.) Even more so: Pearl knew better. She'd been through who knew what thanks to her mom, and yet, she still does some things. WHY ARE YOU SO FRUSTRATING? Despite all of the above, I did like Pearl. I just wish it was fleshed out more, especially because it had so much potential. I would've cared more about the story and the characters if more time was spent on them and they had flesh instead of black cartoon outlines. Pearl takes place over the course of two years; perhaps that's too long. I just needed more--paint me a story, don't outline it. BUT; HOWEVER; NONETHELESS. Pearl had one thing about it, aside from the concept, that just made it: the prose. It is lovely and effortless and takes a longer book and helps you read it at a faster pace and zoom through the pages (I mean that very positively). I don't want to call it the book's saving grace because I LIKED THIS BOOK, OKAY (I just also can't help, er, ranting about it), but damn. It is very, very good. I could probably pull a quote from every page, something meaningful or fantastically metaphorical or easy as pie (I told you it appeared effortless, and I love when writing is like that). I'll read more of Hall's books because a) I want to (still lookin' at you, Sugar) and b) the prose. So lovely. Pearl is a slightly out of focus novel with compelling elements and simple, lush prose. I called the writing easy as pie, but if the book as a whole were a pie, it'd probably be a rhubarb: sure, it's a little sweet, but it's got more of a tang to it and is almost (deliciously) bitter. Pearl isn't a character with a cookie cutter life and she isn't The Chosen One. She's a character who's life has been rough and a tumble through every second, and she's a character trying to make something out of very, very little. As an artist she understands that it takes a number of tries to perfect what's on the canvas, and that the canvas is never really blank. She makes a helluva lot of mistakes along the way and splatters the paint that is her essence wherever she goes, but in the end, she just might lose that oyster shell and just. be. Pearl. Would I purchase it? Already have it, but if I didn't already, I wouldn't be in any rush to own it. Who would I recommend it to? Readers who don't mind their protagonists with a side of frustration and bad choices, and fans of rougher contemporaries and lovely prose. Your comparison to the Rhubarb Pie is gold!